This is a bit of a different way to use Forever Young. 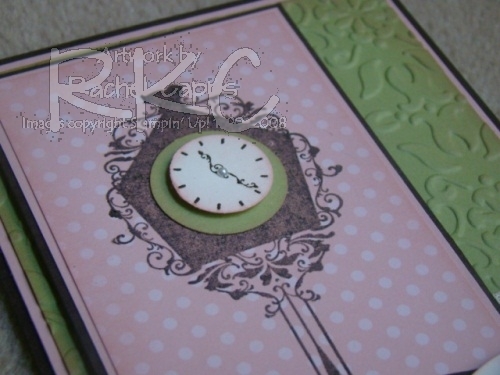 I’ve also used the stamp sets Curly Cute and Pocket Silhouettes. And you can see Vintage Wallpaper embossing folder and the 2010-2012 In Color Patterns DSP Stack plus a touch of Chantilly lace ribbon. I’ve used two different techniques for this card: embossing and marker to rubber. This is a close up of the embossing. This time I stamped the clock in Early Espresso ink, then versamark ink and then onto the Subtles Collection Patterns DSP Pack when I heat embossed with clear embossing powder. 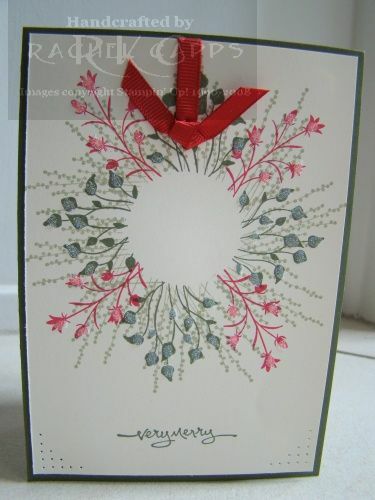 This is a close up of the marker to rubber, using the Pear Pizzazz marker and Blushing Bride marker pens. The colour combo is Early Espresso, Pear Pizzazz and Blushing Bride. This is another card we made for my Cancer fundraiser. I love this card!!! The colours are Pink Pirouette, Crumb Cake and Regal Rose. We stamped Pocket Silhouettes in these colours on the Whisper White card stock and we also stamped tone-on-tone with Regal Rose on Regal Rose on the background paper. The sentiment was stamped from the Level 3 hostess stamp set Occasional Quotes in Regal Rose ink. The gorgeous butterflies are from the Beautiful Wings embosslits dies and, of course, had to have a few Rhinestone jewels added for bling! This is a card I made that was totally inspired by a gorgeous card on SCS here. 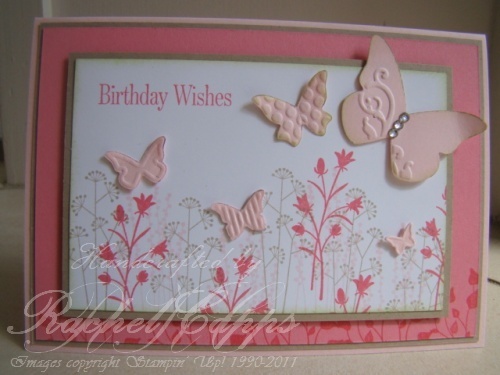 I love embossing, and making this card gave me the chance to emboss again. When I haven’t embossed for a while, I forget how much it facscinates me. Does that ever happen to you? Perhaps with a different technique? Embossing again makes me want to emboss even more!! Anyhoo, the colours I used are Elegant Eggplant, Tempting Turquoise and Green Galore. Along with Pocket Silhouettes, I also used Sincere Salutations. I’d say Sincere Salutations has to be one of the most versatile stamp sets out there! This is a card I’ve made for my mum’s birthday. It was entirely inspired by Kim Lampone on SCS here. 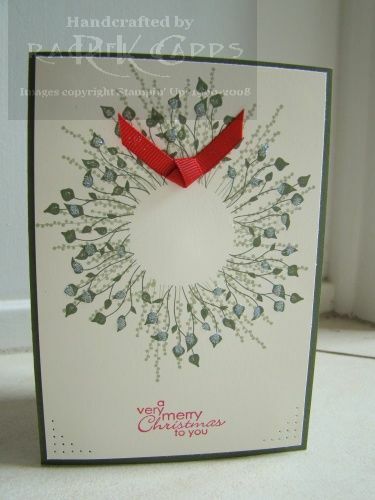 Thanks for gorgeous card, Kim! I have changed the colour though, and not just because Soft Suede isn’t available in Australia but because mum loves green. So, I went with Mellow Moss. I really love monochromatic cards! I’ve used the stamp sets Pocket Silhouettes and Sincere Salutations. 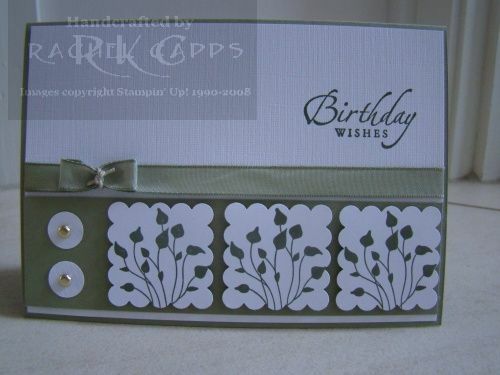 The Whisper White cardstock you cam see is actually textured. Now, I better go stamp up some paper to wrap her pressie and pop it in the post (she lives in country NSW – Koorawatha)! 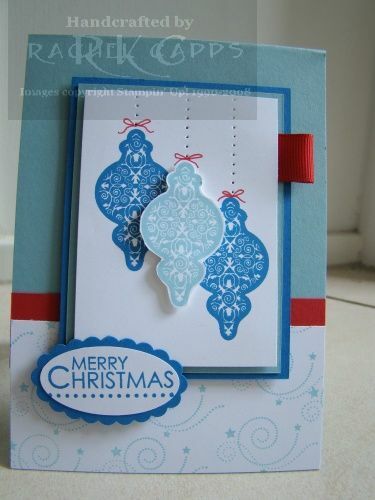 These are some of the designs I used for the Christmas stamp-a-stacks I ran for customers/friends last year. This one is one of my personal favourites and was inspired by Nancy Littrell on SCS here. 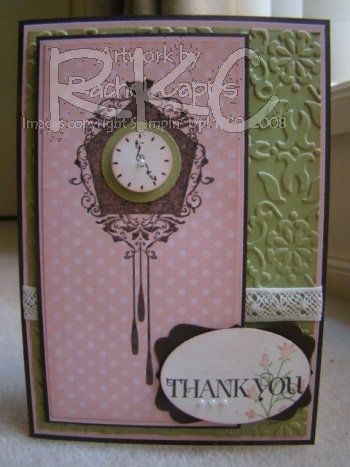 It was made using the masking technique, sponging using the colours Pacific Point and Pink Pirouette. 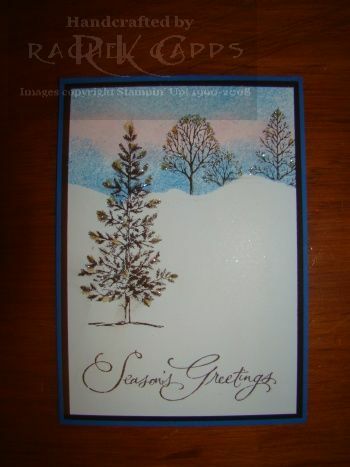 The stamp sets are Lovely as a Tree and Many Merry Messages. These two were inspired by Albongo on SCS here, using the stamp set Pocket Silhouettes, plus Best Yet and Short & Sweet. 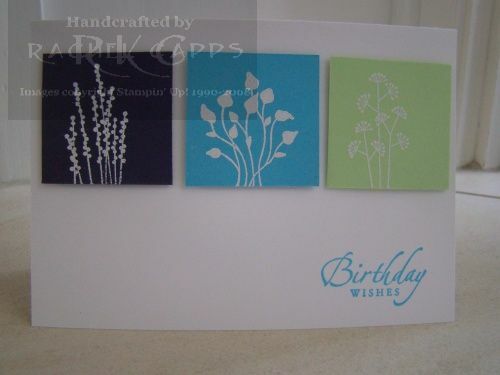 Again, these cards used the masking technique. And the colours are Very Vanilla, Always Artichoke, Mellow Moss and Real Red. Plus, you can’t have a Christmas card without lots of Dazzling Diamonds! The next one is a subtle colour combo, using Sahara Sand and Bashful Blue. 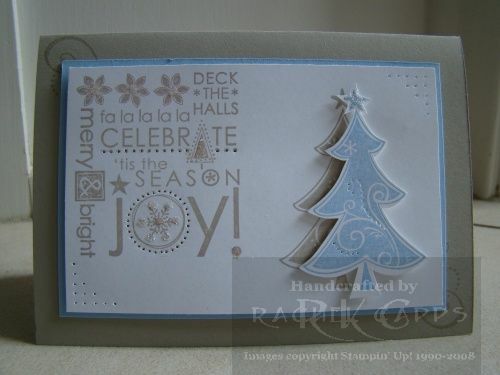 The stamp set is Season of Joy – so versatile! The last card uses the colours Pacific Point, Baja Breeze and Real Red which was inspired by the incredibly talented Jenny at Stamping Moments here. The stamp sets are Tree Trimmings, Spotlight on Christmas for the swirl on Whisper White and Season of Joy for the greeting.